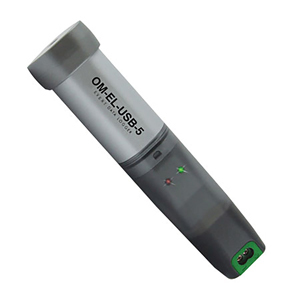 The OM-EL-USB-5 standalone data logger can record events (detecting an input and storing the time and date of occurrence), record state changes (similar to an ‘event’ but also recording when the input reverts back to normal) and count events (count the number of events that happen in a time period, without any individual event time or date information). Up to 32,510 events or state changes can be recorded and up to 32,510 timed intervals in event counter mode (with 65,536 events in each interval). Events and state changes can be triggered by either a rising edge (a voltage going from low to high) or falling edge (a voltage going from high to low). It is also possible to use volt free (dry) contacts. In this case instead of measuring an external voltage, the data logger applies a voltage across the screw terminals and detects when the input closes (e.g., a relay or microswitch). Fast logging rates allow event capturing at speeds of up to two times per second and state changes at speeds of up to four times per second. Event counting can operate at speeds of up to 100 times per second (when the LEDs are turned off). The data logger is supplied complete with Windows software, measurement leads terminated with crocodile clips and a long-life lithium battery which allows logging for up to 1 year. Functionality of the unit is indicated by flashing red and green LEDs. The red LED can be set up to flash every time an event occurs. The user can easily set up the logger, and download the stored data by plugging the data logger into a PC’s USB port and running the included Windows control software. Easy to install and use, the control software runs under Windows® 2000, XP, Vista, 7 and 8 (32-bit and 64-bit). The software is used to set-up the data logger as well as download, graph and export data to Excel. The software allows the following parameters to be configured: logger name, recording mode (events, state changes or count events), triggering on rising of falling edges, voltage or volt free (dry) contact triggering, input voltage range, flash red LED on event/state change, time period for event counting (i.e. count the number of events every 10 s). The maximum number of events per time period is limited to 65,000. 참고: Comes complete with measurement leads terminated with crocodile clips, 1/2 “AA” 3.6V lithium battery, Windows control software and operator’s manual on CD.